Our riders were super happy with the boards and their success proves them right. On the PWA tour Amado Vrieswijk, in his first JP season, achieved his maiden podium to finish 3rd on the tour. Steven van Broeckhoven won the first event of the year but missed the rest of the PWA season due to an injury. The EFPT 2015 was the most successful ever as four JP riders finished amongst the top-5 with Amado Vrieswijk in first, Steven van Broeckhoven in 2nd, Yentel Caers in 4th and Julien Mas in 5th position. For this season the most popular sizes in our range are updated with a radical new concept – the 92 and 102’s shortness and new outlines catch everyone‘s attention instantly. The new generation is more compact and equipped with a striking new nose shape. More impressive moves require faster rotations. Therefore, all the swing weight is centered close to the mast base and the turning point of the board. Due to the compact setup the riders stand close to the rig in a very comfortable stance. This is obligatory not only for big moves but also for sailing in regular stance or when going switch. A higher water position for the board and looser ride was on our priority list as well. This is something our riders cannot get enough off. The new bottom concept has a new V-flow to create enormous lift underfoot and to achieve higher top speed and instant pop. They are stable wide platforms to cover the biggest possible range. The centered volume distribution is the basis of all our Freestyle boards. The outline is rather parallel in the mid-section to maximize the planing surface. The rounder outline towards the tail improves maneuverability and unmatched pop not just for your first jump but also for your following air moves performed during combination moves. The sharp tuck line running from the tail to the mast area is responsible for great grip and drive that creates maximum speed instantly. Towards the nose a super soft tuck line offers an easy transition from aerial maneuvers into sliding tricks by stopping the rail from catching. 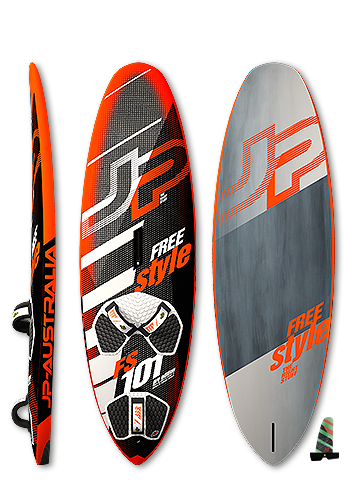 The new freestyle fins can absorb a bit of extra power from the rider without spinout and thus are faster. The slightly smaller tip with less resistance speeds up your rotation in sliding moves. -> All the Freestyle boards are fast accelerators for powerful jumps. The shortness of the two new shapes enhances the handling in all moves and speeds up all rotations. The lively and direct feel imposes confidence that amateurs and pros alike will pull-off more moves in greater style.